One of the central concert events of the year 2015 was the world premiere of Sofia Gubaidulina’s work “The Pilgrims“ for violin, double bass, piano and two percussionists with the Contempo Ensemble in Chicago. This work was commissioned by the Serge Koussevitsky Music Foundation in the Library of Congress. The work will now be given its Austrian premiere at the Salzburg Easter Festival on 25 March 2018. This time the performers will be Matthias Wollong (violin), Andreas Wylezol (double bass), Bertrand Chamayou (piano) as well as Christian Langer and Simon Etzold (percussion). 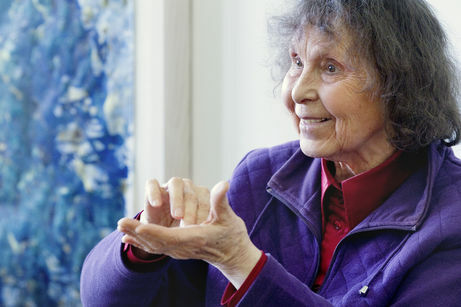 Sofia Gubaidulina has stated that the composition reveals a variation form ultimately based on a passacaglia. The interpreters are more or less like “pilgrims“ undertaking a “procession in sound“.